Swimming in Switzerland doesn’t just have to mean swimming in a lake or pool. There are also many rivers that are welcome relief from the hot weather. Swimmers can cool down while they float along in the gentle currents. Today we explore the Badi in Dachsen, a village on the outskirts of Schaffhausen, and close to the famous Rhein Waterfalls. It is set along the river but also has the added convince of swimming pools and facilities as well. Local mum Alison shares with us the details. Badi Dachsen. Rheinauerweg 1, 8447 Dachsen. Located just south along the Rhein from the waterfalls of the same name. 11:00 - 20:00 (open from 10:00 during school holidays). Situated in a small village, arrival is easiest by car although the S33 train from Winterthur will drop you nearby. Once in Dachsen, the Badi is well signposted and free parking is nearby (2 large car parks and all along the bridge leading down to the Badi). After parking head down the forest path which will lead to the swimming area. Badi Dachsen is beautifully situated along the river Rhine offering a calm, peaceful and secluded swimming spot. 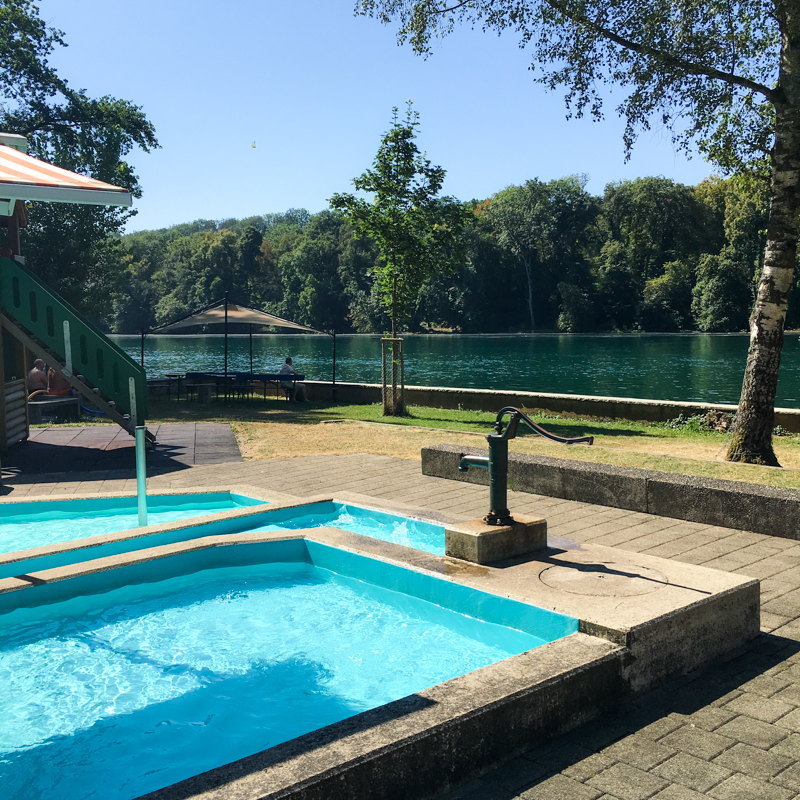 There are two spacious swimming pools available for both swimmers and non swimmers as well as a playground, diving board straight into the Rhine, food kiosk, changing rooms and seating area in which to relax. For the more adventurous amongst us, 5 CHF will buy you a ticket to board a small tourist boat that will drop you close to Rhine Falls so you can float back to the Badi at your leisure. These boats leave regularly and you can buy your ticket and rent floatation devises and life jackets from the kiosk (children under 13 years of age must be accompanied by an adult). The food kiosk offers mainly snack food such as hot dogs, chips, toasted sandwiches etc but there is a bbq station from which you can buy burgers etc. There’s also a grilling station should you wish to bring your own food. As a mum of two young boys I would never go to the Badi without taking along flotation devices, water toys and more recently snorkel masks and flippers. Thanks Alison for sharing with us a great place to cool off here in Switzerland. Your favourite place to swim in Switzerland not on the “My Badi” list? The SFT community would love to hear from you! Scroll to the bottom on the My Badi page and complete the easy to fill in form to have yours added to the list! Good to know: River currents can be unpredictable so make sure you assess each river to your swimming ability. Life Jackets are a very good idea.